I’ll always remember that familiar smell when I walked through the door after school. Mom had homemade buns in the oven, while others sat cooling on linen cloths she laid out. My personal preference was fresh from the oven. 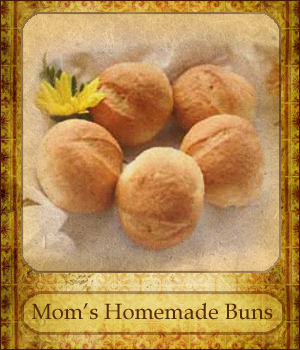 No butter, no jelly–just my tastebuds experiencing one of the greatest blessings in life–Mom’s Homemade Buns. Bake 400°F 15 – 20 min. Mix flour yeast and salt in a large bowl. Clear a center in the mixture and add oil and warm water (& milk). Mix together with dry ingredients. Knead and add flour to consistency. Cover and let rise in slightly warm oven, approx. 1 hour. (Keep light on in oven for warmth and keep oven off). Put a pan of water in the bottom of the oven while dough is rising. It should double in consistency. Punch Down and let rise again ½ hour. Form into buns. Let rise in pans, approximately 1 hour. Bake 1 pan at a time.